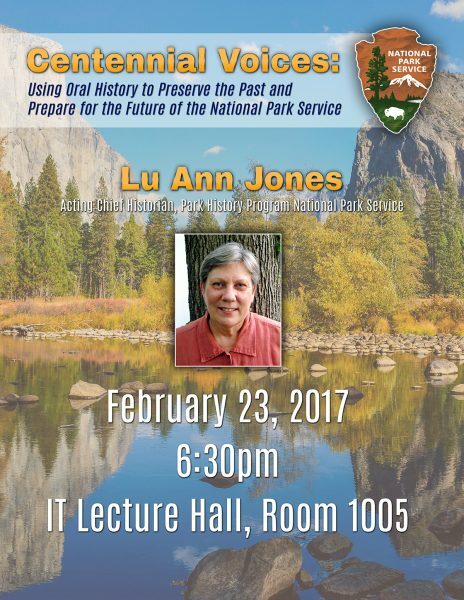 The lecture will be given by Lu Ann Jones, former acting chief historian of the Park History Program, part of the National Park Service, on Feb. 23 at 6:30 p.m. in the IT building lecture hall, room 1005. Jones specializes in oral history research methods and the history of women, labor, agriculture and the American South. During this lecture, she will speak about preserving the past through oral history. The Park History Program preserves and protects our nation’s cultural and natural resources by conducting research on national parks, national historic landmarks, park planning and special history studies, oral histories, and interpretive and management plans.